I was feeling nervous as my mom, my brother and I walked to the baggage claim area at St. Thomas airport to meet my three best friends from college. 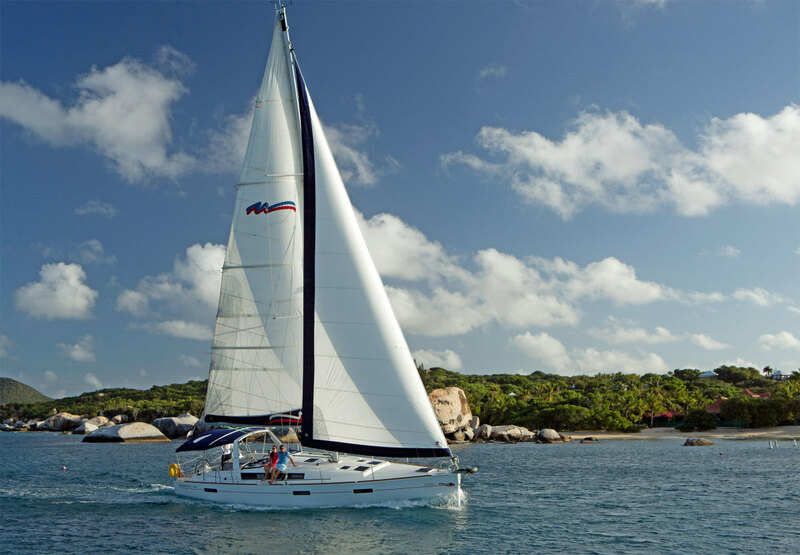 Non-sailors all, Andrew, Alex and Wayne were joining us for a week’s bareboat charter in the BVI aboard a brand new Moorings 45.3. I had grown up in a sailing family, and this was my first chance to introduce my closest friends to this fundamental part of who I am and where I come from. This colliding of worlds would set the tone for the remainder of the week. When we arrived at the marina and hoisted our bags onto Harmony, our floating home, the excitement truly set in. This 45ft Beneteau was spacious and comfortable. My friends, wide-eyed and perhaps slightly nervous, began the foreign exercise of stowing their belongings. The most worrisome boat baptism is, of course, familiarizing oneself with marine plumbing. As I taught my friends how to keep a seaworthy cabin, the importance of mindful use of water, and the added care and careful instruction that came along with tasks that are so automatic to us on land—flushing toilets, opening the fridge—I reflected on how much we, in our rushed daily lives, take for granted. The sunset on our first evening in the British Virgin Islands, and we watched in exhausted awe while sipping painkillers at the marina bar. Our seventh crewmate, my godmother Dawn, joined us, shifting the numbers such that I was squarely in the middle of my three college friends (greenhorns) and three family members (experienced sailors). I couldn’t wait to see how this collision of worlds and experience would unfold—and what better setting could we have asked for? We woke the next morning ready for action and set to work planning and preparing for our week. Aiming to be as thrifty and self-sufficient as possible, we planned to cook all meals aboard. With the fantastic galley featuring a reliable fridge, large stovetop and oven, and abundant storage for food, this was to be an easy task. Our single provisioning trip that morning would tide us over for the entire voyage with food to spare. After some additional raids of the marina for snorkel gear, extra towels and one final latte from the coffee shop, we cast off from the dock and set sail for Little Harbor on Jost Van Dyke. I took the helm once we left the harbor, simultaneously brimming with excitement and feeling at total ease while my mother and godmother gave my friends a tutorial on how to raise sails. School was cut short by darkened skies heralding a nasty squall that had us all in rain gear and lasted all the way to Little Harbor, whereupon the rain abruptly stopped. We picked up a mooring beneath sunny skies, and quickly all was silent. We had the harbor almost to ourselves, and there was nothing to see but blue skies, turquoise sea and the small bay littered just with a handful of small buildings. We spent the afternoon snorkeling and sunning ourselves on the deck before heading ashore for a painkiller at sunset. Being the only people at the bar, the owner invited us to help ourselves and make our own drinks! We ended the night back on board and enjoyed a meal together, the boundaries between family and friends, new and old, already fading. 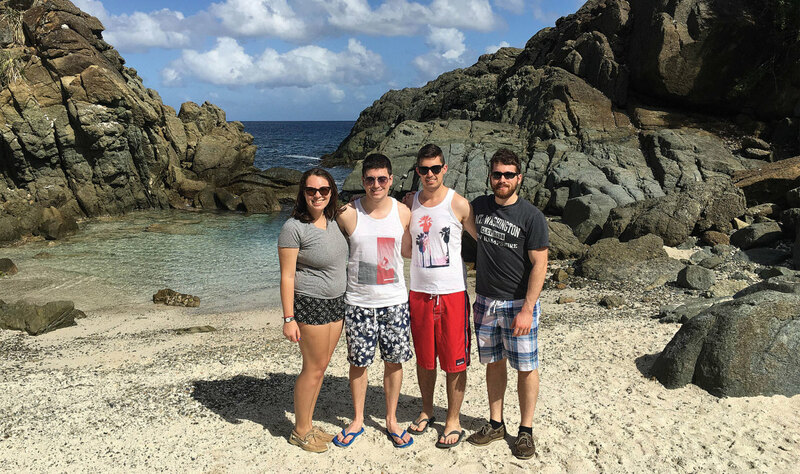 Our exploration of Jost Van Dyke continued the next day with a quick sail to Diamond Quay, where the youngsters of the crew piled into the dinghy and set off to shore on a quest to find the famed Bubbly Pool. After taking in our fill of swimming in the jacuzzi-like surf of Bubbly Pool and enjoying the incredible scenery, it was time to return. The swells had begun to build, and I launched the dinghy with increasing trepidation. My friend pushed us out into deep enough water and successfully flopped back into the dinghy, but the motor would not start. I cursed as the growing waves washed us back to the beach again and again. Despite the frustration, it was hard not to see the humor in the complete inability of four college-educated, seemingly competent young professionals to start a simple outboard motor. After 15 minutes of wrestling, and with our stomachs aching from laughing, the motor finally roared to life, and we made our victorious crossing back to Harmony. We deserved a good cocktail after the Battle of the Dinghy, so we headed over to White Bay, birthplace of what is to this day all of our favorite cocktail—the painkiller. White Bay was truly beautiful, a long white-sand beach that opened out to the sun setting on the horizon behind the mooring field. It was with heavy hearts that we left this tropical paradise the following morning. After three days of secluded natural escapes on Jost Van Dyke, it was time to head back to explore some of Tortola. With the weather finally on our side, we enjoyed a gentle sail to Trellis Bay. After their stormy intro (duction to sailing on our first day, my friends seemed just as at ease during this peaceful passage as my family did. I took up my favorite position at the bow with my feet dangling over the rushing water, sharing with my friend&apos;s childhood memories of doing the very same thing. Trellis Bay was bustling with activity compared to our previous stops. My friends and I again conquered the outboard motor and went on a dinghy adventure to shore, where we explored a quirky collection of artist’s workshops and stores. We also took the opportunity to clear out our trash, restock some provisions and reluctantly tap into Wi-Fi to check our emails. After a painkiller and some fried conch, we disconnected and retreated back to our escape from reality aboard Harmony, where my mom and godmother, “the grownups,” had cooked a delicious curry. Over dinner, we chatted about our lives back home and how different this was from anything we had done before. My mom and godmother also shared stories of their adventures from when they were our age. I was amazed to hear these stories I had never heard before from my mom and grateful for this unique opportunity for a new level of connection and understanding. 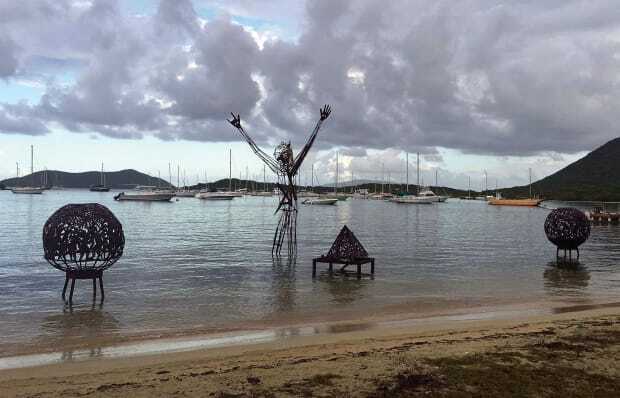 With our trip more than halfway over, we awoke the next morning to the sounds of the grownups picking up a mooring in Virgin Gorda—they had left Trellis Bay at sunrise to secure a spot at the famous Baths before the influx of tourists. We made our way ashore and, without a place to land the dinghy, got a surprise workout by swimming with our belongings held high above our heads. I smiled to myself as I watched my friends rise to this absurd occasion effortlessly, despite their having to swim one-armed to keep their cameras dry, an obstacle not often faced in our daily lives. The Baths were certainly worth the hype—spectacular natural rock formations laced with networks of tunnels and caves carved out by the sea. Unfortunately, their beauty is a huge draw for tourists, and when the buses from a large cruise ship arrived we quickly made our one-armed return to Harmony in search of the peace and quiet we had come so accustomed to. Still, the Baths were well worth a visit, and our early morning timing helped us beat the crowds and see the best of this treasure of the BVI. We wrapped up our time on Virgin Gorda at the Bitter End Yacht Club, a place I had visited with my family as a child. On yet another dinghy adventure—we were pros by now—my brother, Harry, and I showed my friends the places we had visited as children and even introduced them to what must be a very old iguana, which we had fed cherries by the side of the pool. We then enjoyed what had become our afternoon routine of snorkeling, swimming and a sunset painkiller at the Bitter End. That evening over dinner and wine we admired the boats that were all around us, and daydreamed of futures with swanky yachts and seafaring vacations. For our final day before returning to the marina, we took advantage of another early start to see another natural wonder of the BVI—a collection of rocks and reef called The Indians. From the moment we dipped our masks below the surface we were awestruck by the teeming marine life. Transported to another world, we spent the morning exploring the reef and encountering a seemingly infinite number of different kinds of fish. We even spotted a turtle, who let us casually follow him before taking off with surprising speed into deeper water. We experienced another kind of BVI life that evening when we picked up a mooring in the Bight on Norman Island, beside the infamous Willie T boat-turned-bar. We ended our last night in the BVI in quintessential Norman Island style by following up our evening painkillers with the traditional jump from the stern of the Willie T.
When we fished out all our nicely stowed belongings and packed them back up to return to our separate lives, it was with a sense of calm and peace that none of us had possessed when we stepped aboard a week before. My friends had the opportunity to experience a new way of life, and my family to see an old pastime through fresh, excited eyes. Without the bustle and distraction of work, school and stress, we were able to connect more deeply with each other and our experience exploring the BVI aboard our Harmony.